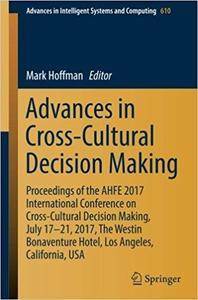 This book reports on the latest advances in understanding cross-cultural decision and human cognition with respect to various cultural constructs, such as geographical, historical, sociological, and organizational cultures. It addresses researchers, scholars, and industry practitioners from diverse fields, including sociology, linguistics, business, military science, psychology, human factors research, neuroscience, and education. The book covers a wealth of topics, including: analyses of historical events and intercultural competence; commercial applications of social-cultural science; the study of decision-making similarities (and differences) across cultures; cultural behavioral modeling and simulation technology; and social networks and studies on group communication alike. It also reports on real-world case studies relevant to cross-cultural decision-making. The book’s main goal is to combine studies from other relevant disciplines such as causal analysis in complex environments, team decision making and social changes to develop a more holistic understanding of the decisions that people, groups, and societies make, so as to improve our ability to forecast and plan for the future. 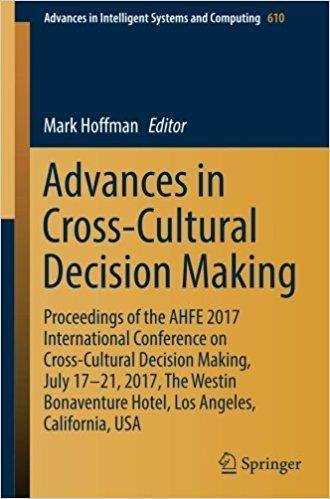 Based on the AHFE 2017 International Conference on Cross-Cultural Decision Making (CCDM), held on July 17–21, 2017, in Los Angeles, California, USA, this book offers a multidisciplinary view on the impact of culture on people’s cognition and behavior, and a timely reference guide to new applications and future challenges.